Let’s now move to some of the evidence. Which are best? Fixed or removable functional appliances…. It is now many years ago that we carried out a multicentre trial that compared the Herbst and the Twin Block appliance. This can be found here. I was also one of the operators in the study and I learnt a lot about using fixed functional appliances. My personal experience was that the Herbst appliance was very effective but the trade-off was that we had major problems with breakages. As a result, several years later, my preferred appliance is still the Twin Block. This is my personal opinion reinforced by the results of our trial, but what does this new review tell us? A comparison of the efficacy of fixed versus removable appliances in children with Class II malocclusion: A systematic review. This was a nicely written paper. I thought that the literature review was particularly good and I recommend that anyone on a training programme should read this as it provides a great outline of functional appliance treatment. In addition to outlining the various advantages and disadvantages of the types of functional appliances the authors also pointed out that we need to move away from purely morphological measurements and include patient perspectives. I have covered this subject previously another blog posts. Their objective was to provide evidence on the efficacy of fixed and removable functional appliances in terms of both morphological and patient centred outcomes and I felt this was very important. They carried out a systematic review to high standards and they clearly stated the PICO. Outcome measures: The primary outcomes were measures of skeletal, dento alveolar and soft tissue correction. This review was carried out to a high standard as they only included randomised or nonrandomised trials. All the studies had to be prospective. It is important to work to this high level of selection criteria because this reduces the chance of selection bias that is inherent in retrospective investigations. After their screening and application of selection criteria they identified four studies. They evaluated these studies with the Cochrane Collaboration risk of bias tool and provided a large amount of information on potential bias. They concluded that three studies were at high risk of bias and one was unclear. The most common reason for this allocation was unclear randomisation and allocation concealment. I find it interesting that one of the studies they classified as “high risk of bias” was the Herbst vs Twin Blocks study that I carried out. In this study we reported that we had a greater dropout rate in the Twin Block group than the Herbst group. As a result, the authors classified study as being at high risk of bias. This is the correct conclusion from applying the Cochrane tool. However, it is important that this does not diminish one conclusion from our study in which we found that there was better cooperation with the Herbst appliance than the Twin bBock. Putting this aside, I will never forgive the authors for this classification! More seriously lets look at what they found. Firstly, two of the studies compared with the Twin Block and the Herbst appliance while the other two compared the Activator with the Forsus and the TFBC appliance. It was not possible to combine the data into a meta analysis because of differences in measurement between the studies. They did provide a lot of detail of relevant cephalometric measures that showed the effect of the appliances on dento alveolar and skeletal measurements (which were small). They concluded that all the variations of functional appliance successfully reduced the overjet to normal limits. There were also minor skeletal changes but as these were not compared to an untreated control group. We cannot, therefore, make any conclusions on whether the appliances changed the skeletal pattern more than normal growth. They also stated that they were disappointed at the limited use of patient centred measures. They drew attention to our study in which we measured breakages and patient acceptance of the appliance. They also pointed out that our findings would have been viewed very differently if we had drawn greater attention to them in our paper. I completely agree, if I had my time again I would have emphasised the patient centres measures more. For example we showed that the Twin Block had a greater negative affect on speech, sleep patterns and schoolwork and the length of the treatment was longer than with the Herbst. Yet there were greater breakages with the Herbst appliance and it was more expensive. This information should be very useful when we are deciding on potential treatments with our patients. I feel that this review does add to our knowledge, despite the limitations of the number of papers. I can conclude the following. There is little difference in the dental and skeletal effects of fixed and removable functional appliances. Most of the correction of the overjet is by dento alveolar movement, but there is a small amount of skeletal change (1-2mm). There is greater co-operation with fixed functional appliances but this is not 100%. There is no such thing as non compliance orthodontic treatment! Only one study reported on patient centred outcome and these should be included in all trials in addition to some cephalometric and dental measurements. I will still stick with the Twin Block because of the cost and the additional time that is needed to deal with breakages with a fixed functional appliance. I did this post with Badri Thiruvenkatachari, who has worked with me for several years, and was the lead author on our updated Cochrane Systematic Review, on the treatment of Class II malocclusion. This can be accessed on http://goo.gl/puzQR5. This is one of the largest and most cited orthodontic Cochrane Reviews and was first published in 2007. One of the requirements of carrying out a review for Cochrane is that you have to commit to update the findings periodically. This means that as new knowledge from studies becomes available, this is included into the reviews. In effect, the review is a “living document” and the conclusions may change with time. This is one of the great advantages of Cochrane reviews compared to the more static conventional literature. The downside is that you are committed to updating your reviews for as long as you are working! It appears that the journals are publishing more and more systematic reviews. This review was on the effects of removable functional appliances on the skeletal pattern. Treatment effect of removable functional appliances in patients with Class II malocclusion: A systematic review and meta-analysis. The authors aimed to assess the effects of removable functional appliances in treated vs untreated patients using outcomes from radiographs. Bearing in mind my comments about radiographs and research, I did start reading this paper with a degree of trepidation, as I feared that I was entering a morass of cephalometrics. However, I was pleasantly surprised and I thought that this was an interesting and relevant review. When I started reading I did become concerned because they did not confine the review to RCTs and included prospective non-randomised controlled clinical trials. As a result, we need to bear in mind that this is not as high a level of evidence as a Cochrane review, which only includes randomised studies. However, reviews of this nature do have a place, as long as we remember this shortcoming and interpret them accordingly. They outlined their methods in a very clear way. It was good to see that they carried out a quality assessment of the literature that they included. They did this by assessing the RCTs with the Cochrane risk of bias tool and the CCTs with a similar instrument. They finally used the GRADE methodology to evaluate the overall strength of evidence from the review. They included 17 studies and these were divided up into 7 RCTs and 10 CCTs. They carried out a series of planned meta-analyses. These were clearly set out. They also found that the Twin block was the most effective appliance, when compared to others. The strength of evidence according to GRADE varied from moderate for SNA change to very low for ANB change. They finally concluded that the skeletal effects of RFAs are minimal and of negligible importance. Most of the change was dental. I thought that this was an interesting review that came to good sensible conclusions. I was a little concerned about the inclusion of CCTs, particularly when there was an adequate number of RCTs to draw some conclusions. However, they did report this in sufficient detail for the critical reader to interpret the evidence that they presented. “WE CANNOT GROW MANDIBLES OR RESTRICT MAXILLARY GROWTH TO CORRECT SKELETAL DISCREPANCIES WITH REMOVABLE FUNCTIONAL APPLIANCES TO A CLINICALLY MEANINGFUL DEGREE”. I actually think that it is time to move on…….I now wonder whether it is necessary to carry out any more studies on the cephalometric effects of removable functional appliances. This review systematically covers a large amount of the published literature and it pretty much says it all…. Does this finding help us in practice, when we see a patient with a Class II malocclusion. If the skeletal discrepancy is mild to moderate then I would be fairly certain that if I used a functional appliance I could obtain a good result from a combination of dental movements and some favourable growth. But what if the skeletal discrepancy is severe? I think that I would treat with a functional, but I would warn the patient and parent that they will still have a skeletal problem and this may need surgical correction in the future. Do functional appliances influence skeletal pattern? More reviews giving us the answer! In the final section of this summary I’m going to review two systematic reviews on functional appliances. Both aim to identify skeletal effects of functional appliances. These investigators carried out a systematic review to evaluate the effect of fixed functional appliances combined with multi bracket appliances on class II skeletal pattern. They carried out a systematic review of articles published until April 2014. They included papers reporting randomised clinical trials and non-randomised controlled clinical trials. Each study had to include an untreated control group. Their main outcome measure was cephalometric data collected at the end of the functional phase of treatment. They assessed risk of bias with the Cochrane tool for RCTs. They used the Newcastle-Ottawa scale to assess the quality of the non-randomised studies. They initially identified 1366 papers and after the usual filters they identified 5 trials. These were divided into 1 RCT, 2 quasi RCTs and 4 prospective controlled trials. There was some variation in the measurements used in the studies, nevertheless, they did extract data on relevant measurements. This data was not presented in the table and I found it a little difficult to follow. In summary, they showed that the use of fixed fractional appliances when combined with multi-bracketed appliances did not have an effect on the skeletal pattern. However, the evidence was weak. This was a paper from a team based in Italy and Greece. They carried out this systematic review to find out if there was an effect of removable functional appliances on maxillary growth. They included studies that were randomised controlled trials and prospective controlled clinical trials that included an untreated control group. Again, the outcome measure was cephalometric measurements. They carried out the usual search, filtering and assessment of risk of bias. They finally identified 14 papers. These were divided into 4 RCTs and 10 prospective CCTs. They also found that there was a mean difference of -0.61 mm in anterior maxillary displacement. There was no effect on maxillary rotation. In the discussion they pointed out that they only found a small number of trials and this led to a large amount of variation in the data. Nevertheless they did conclude that removable functional appliances appeared to inhibit sagittal maxillary growth. A few weeks ago I covered another systematic review on the effects of functional appliances on skeletal growth. You may remember that this was on the effects of fixed function appliances and the authors concluded that there was no influence on the skeletal pattern to a meaningful degree. It is interesting to see that these two papers have reached the same conclusion. In the comments section of one of my previous posts Carlos Flores-Mir pointed out that in the last 10 years there have been 25 systematic reviews on class II treatment. He also felt that the most important findings from any trial should be concerned with factors such as compliance and patient experience. I totally agree with him. The authors of both of these papers made the “usual” conclusion to a systematic review that “more RCTs were needed”. I am not sure that I agree with this statement as it is now becoming very clear that functional appliance treatment does not influence cephalometric measures to a clinically important degree. Nevertheless, I think that if further trials are to be carried out investigators should evaluate other outcomes such as compliance, experience, socio-psychological factors, trauma and even breathing. These are far more important outcomes that are relevant to our patients. I cannot help feeling that we are in danger of carrying out too many systematic reviews into Class II malocclusion based on cephalometric measurements. There appears to be a trend to review the effects of every individual functional appliance on every different facial bone! I am worried that we will soon be having systematic reviews of systematic reviews in the endless quest to find out if we can alter facial growth. At this point I’m sure that the question has been answered. I will also not write another blog on a systematic review on the effects of functional appliances. Finally, I will make a plea to investigators and Journal editors. Please make this stop….. and I do not think that CBCT will tell us any more than we know now! 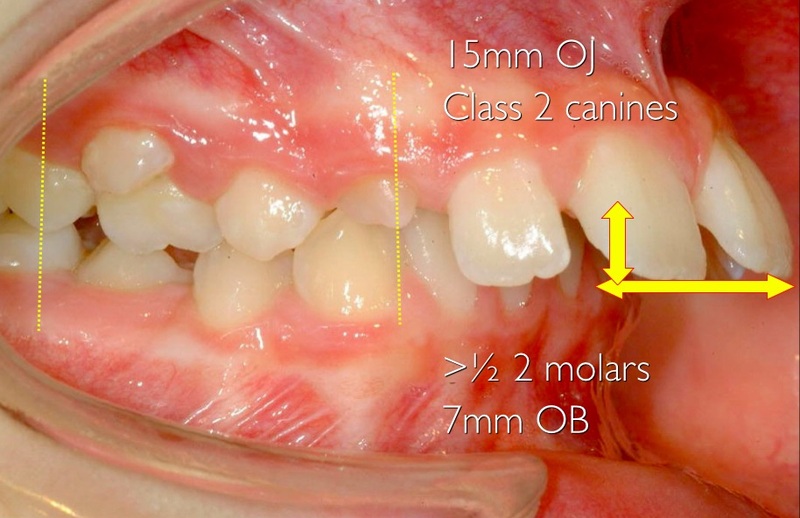 There are limited advantages to providing early orthodontic treatment of Class II malocclusion. However, there may be reduction in the incidence of trauma. Early treatment could also be provided to reduce teasing and bullying, but only if a child is being teased or bullied. Most of the reduction in overjet is achieved by tooth movement. There is minimal skeletal change and this cannot be predicted. When we provide treatment in adolescence there is nothing wrong with extracting upper first premolars and reducing the overjet. This treatment is practiced all over the world in countries where functional appliances are not so extensively used. The Twin Block is the most popular functional appliance in the UK. There is no point in putting on or leaving off the labial bow on a Twin Block. No one can grow a mandible! Thanks for this helpful post. The only issue with treating large overjets early under the GDS (in Scotland) is that, whilst there can be improved self esteem and a 40% reduction in incisal trauma risk, you are often preventing them from having an overjet >6mm when it gets to the definitive phase of treatment – so they don’t receive funding for alignment / detailing because you have made them IOTN ‘borderline’. This is an unfortunate situation to say the least! I must comment on your conclusion that “Most of the reduction in overjet is achieved by tooth movement. ” Actually, “most of the reduction in overjet” can be seen a millisecond after appliance placement. This instant reduction-by-Sunday-bite clearly can’t be due to tooth movement. The key to functional treatment and the retention of resultsis to hold the mandible forward until the normally-seen mandibular excess grows the condyles back to the fossae, rather than expressing itself as unwanted maxillary dento-alveolar compensation. Note that, in the European literature, the key to stability is said to be a solid occlusion or retention with an activator. Both, by way of operant conditioning, would keep the mandible forward until growth–normal growth–can make the Sunday bite permanent. American orthodontists revere motherhood, the flag, apple pie…and a good occlusion. But why a would a good occlusion be necessary to preserve actual mandibular growth? Perhaps good occlusions also could stamp out hunger in Africa or deliver us from the threat of nuclear holocaust. I digress. A functional appliance takes out a mortgage on mandibular position that the usual pattern of growth (Class I and II, alike) commonly can amortize. Cephalometric superimposition–although much reviled of late–shows that there is, on average, less than a mm of tooth movement, most of it lower anchorage loss. Of course, there would be more of this loss in Herbst treatments. In these studies the retrusive maxilla, present in all Class II malocclusions, has not been addressed. In order to bring about functional correction of the musculature it is necessary to develop the maxilla sagittally as well as the lateral plane before advancing the mandible. This is best carried out in the mixed dentition before the eruption of the permanent buccal segment teeth. The Twin Block can “jump the bite” and this is probably achieved by dento-alveolar bone compensation. This appliance produces a reciprocal force on the maxilla which inhibits the forward movement of the mandible unless the maxillary retrusion is also addressed. A functional orthodontic practitioner would correct the maxilla before attempting mandibular correction. This approach is what changes the skeletal relationship and results in significant profile changes. IMHO there is a need for research into cases treated within this paradigm. To justify Twin Block treatment BEFORE the pubertal growth spurt (when Class II treatment is most effective and efficient) because of ‘teasing’ or psychosocial pressures ignores the speech effects that can only accentuate the problem in such patients with such an appliance. The truth is that anyone can cherry pick the literature to justify their own reasons for treating anyone with any device at any time. Please do not ignore the good Class II literature that has taken orthodontics from the dark past to a future grounded in an ability to provide predictable outcomes for growing patients. If overjet correction is the only reason for early treatment then a short period with an upper fixed appliance will prevent obfuscation with other Class II treatment outcomes. Dr Johnson (post below) has been the single voice of reason in a torrent of self-serving literature that makes it ever more difficult to pan for gold. Thanks for the comment. I am not sure if I cherry picked the literature in this review because I concentrated on the results from systematic reviews. Maybe they missed the good Class II literature that you mention that enables us to predict good outcomes. If so can you let me have the references for this literature and I will post about it. Many thanks Dr.O’Brien. I want to ask about the fixed functional appliances. Are there any differences in the outcomes of the treatment according to the design of the appliance ? Currently there are lots of designs depending on the site of the attachments. As far as I know there are limited differences with the effects of different functional appliances. However, this is not the most important question, if we consider that they are all effective. I think that the most important factor with these appliances are the number of breakages, as this may be problems with fixed functionals. Unfortunately, this is not often reported in the literature. This is an interesting topic of debate! The main deficiency, which provides the basis for a flawed conclusion, is cephalometric analysis, IMHO. It is now known that cephalometric findings cannot be relied upon, so comments like “No one can grow a mandible!” need to be taken with a pinch of salt. I have had the opportunity to study severe midfacial and mandibular anomalies in a Center for Craniofacial Disorders. It was amazing to see the genetic potential of some of these young patients. When we look at the midface, most orthodontists give lip service to the cranial base. My tag line is “the cranial base sets the pace for the rest of the face”. I have looked at cranial base morphology and it deeply impacts the clinical midfacial and mandibular perception/appearance. Bottom line; not all Class IIs are alike. The same way that there are four types of anterior open bite, Class IIs represent a phenotypic variant from the modern cranial base, which is either Long (Caucasian, Middle Eastern, South Asian, white) or Short (North and East Asian, African, black). Prior to Class II correction, one has to ask “why does the mandible appear to be retrognathic?” The atypical answer is “following the cranio-caudal gradient of development in response to midfacial retrognathia”, which is typically misconstrued as ‘protrusion’. When measuring the angulation of the maxillary incisors to the cranial base, they are invariably retroclined in Class II cases. Midfacial bone volume can be increased by targeting the craniofacial sutures, which gives the mandible a functional space to grow into. Numerous adults on long-term mandibular advancement devices for sleep apnea develop Class III maloccusions, as predicted by the Spatial Matrix Hypothesis. I think that relying on old 2D data and 20th orthodontic concepts that we inherited form our professors need to be looked at more carefully, given our increased understanding of molecular genetics, epigenetics and 3D digital technologies. Craniofacial dystrophy…craniofacial epigenetics…the twin pillars of orthodontitis and orthodontosis…all a means to an end. Thanks for the feedback, Kevin. My response was not meant to be a criticism but rather an observation in that sense that the ‘best current evidence’ may not be based on the current technology that we now possess. In response to your second question, I am listing a short, selective series of articles that simply look at the impact of cranial base morphology on facial features downstream, such as maxillo-mandibular relations. We stand on the shoulders of giants, in the sense that these studies follow from previous studies on similar concepts. Singh GD, McNamara JA Jr. and Lozanoff S. Finite element analysis of the cranial base in subjects with Class III malocclusion. Brit. J. Orthod. 24(2): 103-112, 1997. Singh GD, McNamara JA Jr. and Lozanoff S. Morphometry of the cranial base in subjects with Class III malocclusion. J. Dent. Res. 76(2): 694-703, 1997. Singh GD, McNamara JA Jr. and Lozanoff S. Thin-plate spline analysis of the cranial base in subjects with Class III malocclusion. Euro. J. Orthod. 19(4): 341-353, 1997. Singh GD, McNamara JA Jr. and Lozanoff S. Craniofacial Heterogeneity of Prepubertal Korean and European-American Subjects with Class III Malocclusions: Procrustes, EDMA and Cephalometric Analyses. Int. J. Adult Orthod. Orthog. Surg. 13(3): 227-240, 1998. Singh GD, McNamara JA Jr. and Lozanoff S. Midfacial morphology of Koreans with Class III malocclusions investigated with finite-element scaling analysis. J. Craniofac. Genet. Devel. Biol. 20(1): 10-18, 2000. Singh GD, McNamara JA Jr. and Lozanoff S. Allometry of the cranial base in Prepubertal Korean subjects with Class III Malocclusions. Finite-Element Morphometry. Angle Orthod. 69(5): 507-514, 1999. Singh GD, Rivera-Robles J, de Jesus-Vinas J. Longitudinal craniofacial growth patterns in patients with orofacial clefts: geometric morphometrics. Cleft Palate Craniofac. J. 41(2):136-143, 2004. Singh GD. On Growth and Treatment: the Spatial Matrix hypothesis. In: Growth and treatment: A meeting of the minds. McNamara JA Jr (ed.) Vol 41, Craniofacial Growth Series, Ann Arbor, USA, 2004, 197-239. Banabilh SM Suzina AH, Dinsuhaimi S, Singh GD. Cranial base and airway morphology in adult Malays with obstructive sleep apnea. Aust Orthod J. 23: 89-95, 2007. Mitani Y, Banabilh SM, Singh GD. Craniofacial changes in patients with Class III malocclusion treated with the RAMPA system. Int J Orthod Milwaukee. 2010;21(2):19-25. Thank you so much for the helpful post. May i know from which articles/ paper did you get the information about patients in the late transitional or early permanent dentition with moderate overjets (6-10 mm) often with a moderate skeletal discrepancy are best treated with functional appliance ( Twin Block). I am interested in knowing more about this. Thank you for your help. Great blog. I am just a little confused. You mentioned that you use the twin block, but in what situations are functional appliances indicated? When do you use the twin block? Helen Jones; I could not agree with you more. I see many young class II patients with a retrognathic maxilla. Many of these patients have both a retrognathic maxilla and a narrow maxilla, and both of that is best corrected early in the mixed dentition. I think correcting the maxilla (shoe) transversely and sagittally at an early age is important for the growth and development of the mandible (foot).